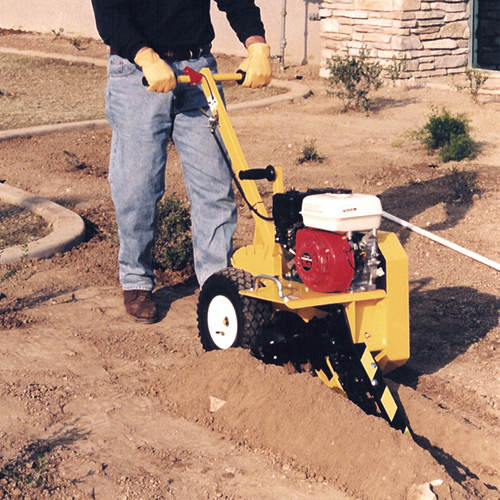 The Ground Hog T-4 Trencher is a small, operator propelled, chain-type trencher designed for jobs requiring up to a 12 or 18 inch deep trench. Heavy gauge powder coated steel is used throughout the T-4’s construction as well as tapered roller bearings and double-row ball bearings to ensure trouble-free service. Over 60 years of experience in the Rental, Construction and Landscape industries has produced a design that is very durable and easy to maintain, which leads to a fast return on investment. The compact size of the T-4 Trencher and it’s built in lift handles make it easy to transport. The unit easily fits in the bed of a small pickup truck and we offer an optional carrier so the trencher can be easily loaded and unloaded by one person and securely transported on the back of any vehicle with a Class 3 or better hitch receiver such as an SUV or van. 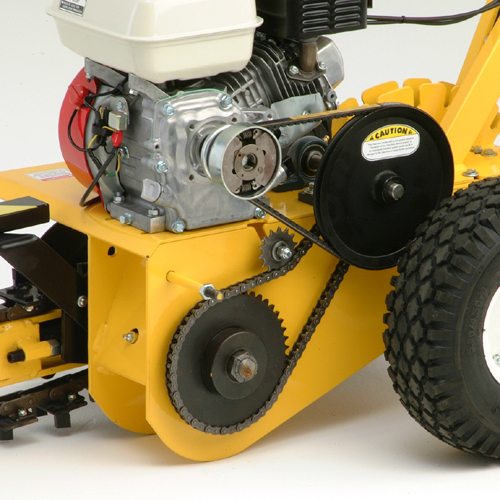 The T-4 Trencher is available with 3 engine options; Honda, Briggs & Stratton Intek and Subaru. Will trench close to walls, fences, etc.